Plant Environment: Does well in morning sun or partial shade locations. Moist to average soils with good drainage are preferred. 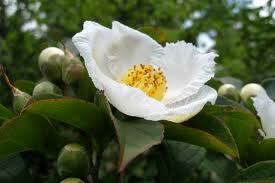 Plant Bloom: White blooms/yellow stamens open in mid-summer for a delightful show. Dried seed pods appear by fall and gradually disappear during the winter months. Stewartias lend themselves well in woodland garden settings as they provide seasonal interest and a modest growth habit. Underplant with perennials for an additional seasonal color display. As the tree matures the bark begins to exfoliate in a blend of gray, orange and reddish brown strips.